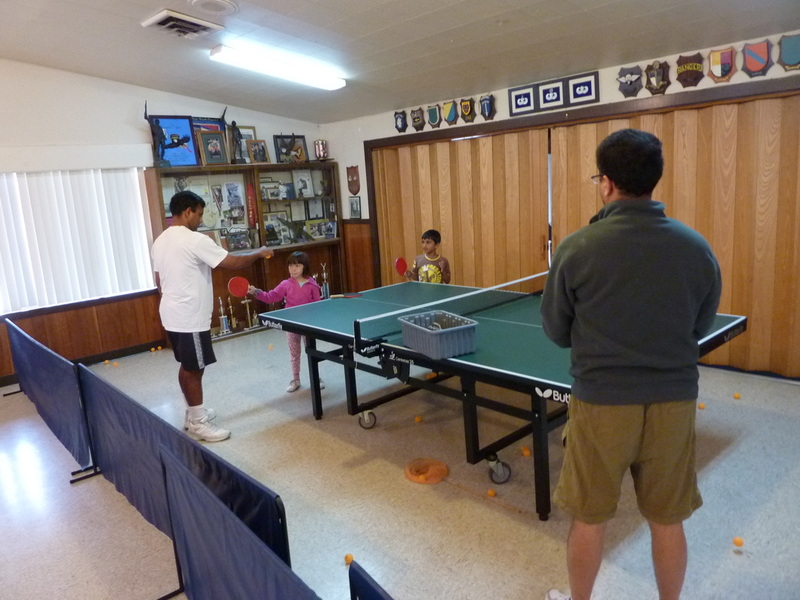 The ping pong clinic was open. Free lessons were provided on Thursdays for children. Stay tuned for the upcoming Winter Clinic! Again, Bill and Harriet collected a bunch of medals from various tournaments this Fall, continuing their marvelous journey of table tennis. The left photo shows the medals Bill won. The 2 top ones are from the warm-up tournament in Las Vegas, the next 3 are the ones from the Huntsman World Senior Games, and the bottom 3 are from the Nevada Senior Games in Las Vegas. 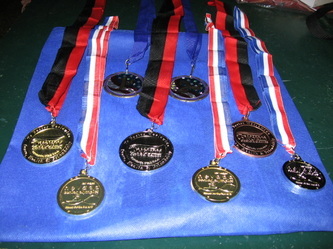 The right photo shows the medals that Harriet won in the same order. 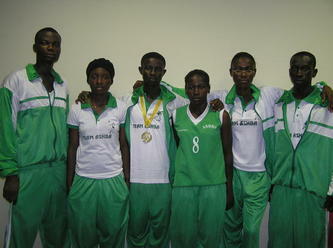 Men's Singles, 85-89, 1st; Men's Doubles, 85-59, with Leo Egel, 1st; mixed doubles, 80-84 with Harriet, 1st. 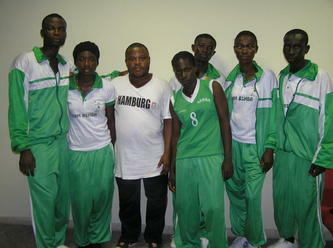 Men's singles, 85-89, silver; men's doubles, 85-59, with Leo Egel, gold; mixed doubles, 80-84, with Harriet, gold. Men's singles, 85-89, bronze; men's doubles, 85-89, with Leo Egel, gold; mixed doubles, 85-89, with Dorothy Peterson, silver. Women's singles, 80-84, 1st; mixed doubles, 80-84, with Bill, 1st. Women's singles, 80-84, silver; women's doubles, 80-84, with Kathrine Kaneshiro, silver; mixed doubles, 80-84, with Bill, gold. Women's singles, 80-84, bronze; women's doubles, 80-84, with Berta Speisman, silver. Pictured is an amazing collection of trophies and medals by Bill and Harriet during this summer only! 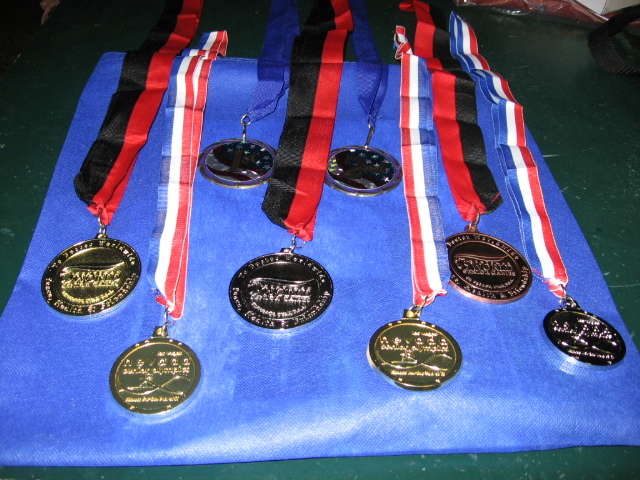 The trophies from the Meiklejohn Tournament, June 3-5, were for third place for Bill in the Over 85 Round Robin; Harriet got third place in the Women's Over 70 Round Robin. 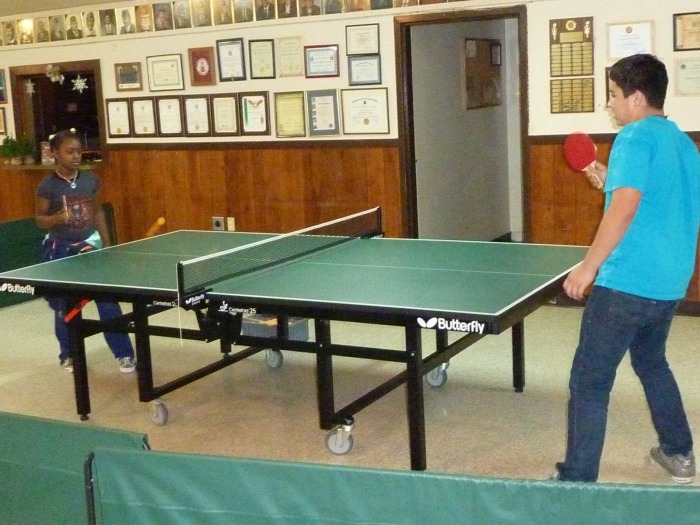 Bill and Harriet also competed in the Random Draw Doubles event. Harriet's partner, Douglass Younan, from Aliso Viejo, CA and Harriet were in the quarterfinals and each got $25 and Bill and his partner, Ky Nguyen, from Stanton, CA were in the semi-finals and won $50 each. 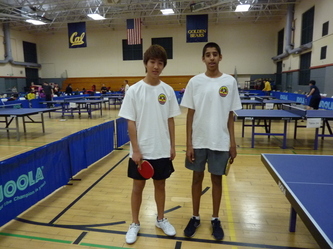 They were beaten by Gao Jun and her partner, Mike Montes. Bill & Ky got to the semis by beating Danny Seemiller and his partner, Sara Cericola, and another team with Ky's friend on it. 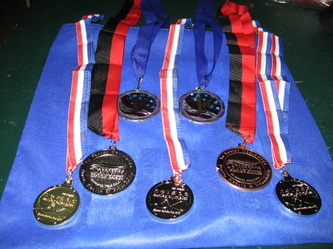 The medals were in events of the International Veterans Championships being held consecutively with the US Open in Grand Rapids, MI (June 30 - July 3). Harriet's gold medals were in the Women's Over 80 and the Women's Over 70 and her bronze was in draw doubles Over 65+ Round Robin. Harriet's partner was Jose Borges from Florida. 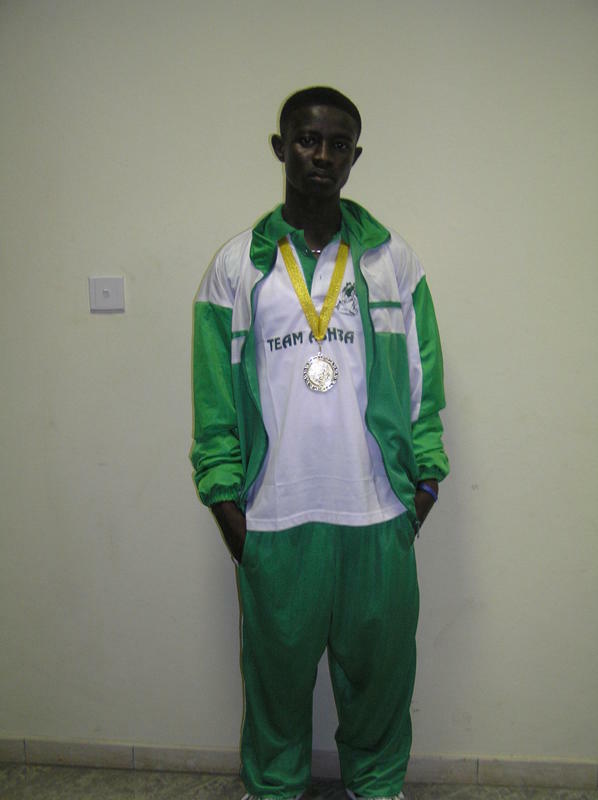 Bill's bronze was in the Men's Singles 80-84 Round Robin. 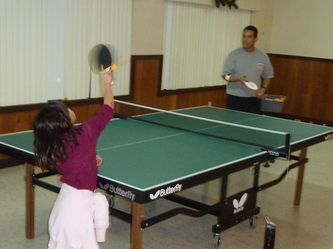 The large trophies were in a Giant Round Robin event at the Las Vegas Table Tennis Club in Las Vegas on July 11. 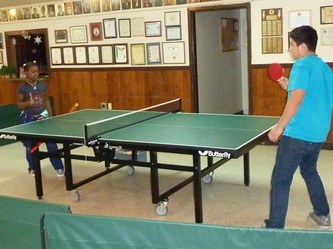 There were 8 round robins of 3 people each; then Bill and Harriet went to Groups A, B & C to play another round robin of about 8 persons. Our group C ended up with 6. Bill won First and Harriet got Second. The first table tennis tournament hosted by the club was held on June 13, 2010 (Sunday). It was open to Monterey County (and adjacent counties) residents and/or the members of the MCTTC/SCTTC. 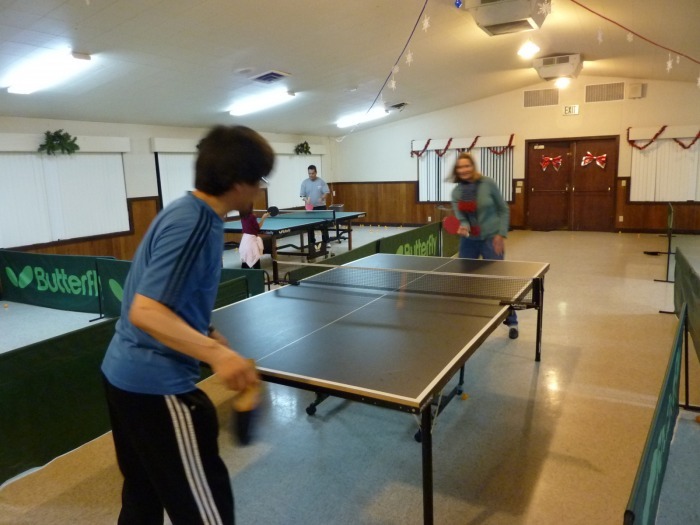 Sponsored by the PaddlePalace and the American Legion, over 50 people gathered to play and watch over 80 matches and countless number of games. Click here for more details of the event. Gil finally had surgery on his right shoulder, which has been bothering him for a long time. - Gil was discharged from hospital and started coming to the club after resting at home for some time. Let's hope he recovers fast. Entry deadline: Feb. 17, 2010, postmark. Free Polo shirt if registering before Feb. 5. Click here for details and the entry form. - Ananda and PD participated! 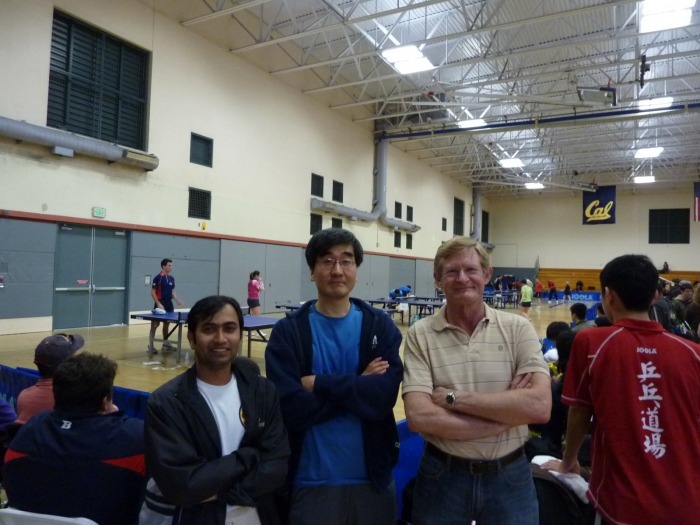 The 2010 Joola North American Tour starts on February 20~21 at the Recreational Sports Facility, UC Berkeley (2301 Bancroft Way, Berkeley, CA 94720). The entry deadline was Friday, February 5, 2010, POSTMARK or register online (find the "Register" tab). Click here for details and the entry form. - Rasheed, Josh, Shrikant, YJ participated and Rick observed. We had some mixed success, including Josh advancing to the playoff in U800. At Santa Clara Fairgrounds (344 Tully Road, San Jose, CA 95111) on February 13~14. 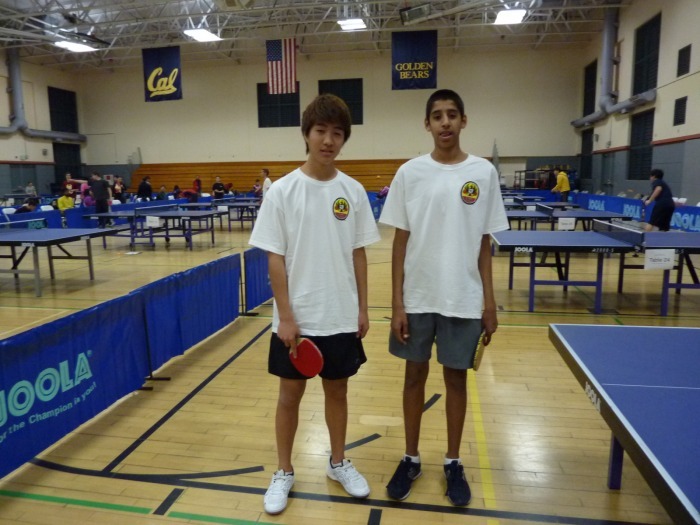 USATT Sanctioned 2-star tournament. 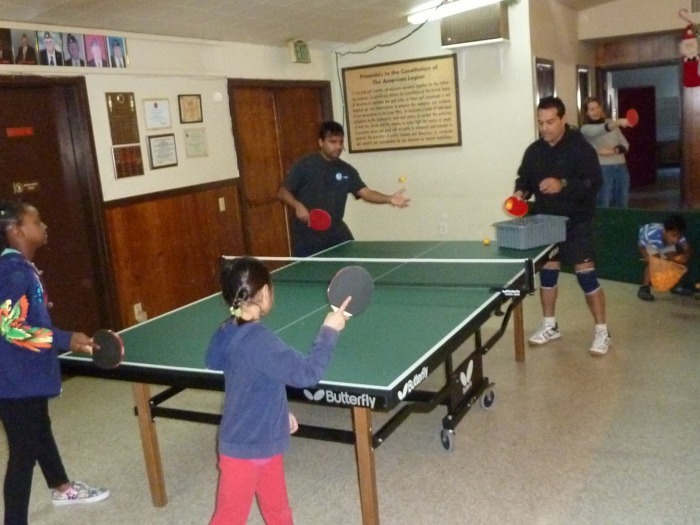 Visit http://www.thetopspin.com or send email to info@thetopspin.com for details including the entry form. 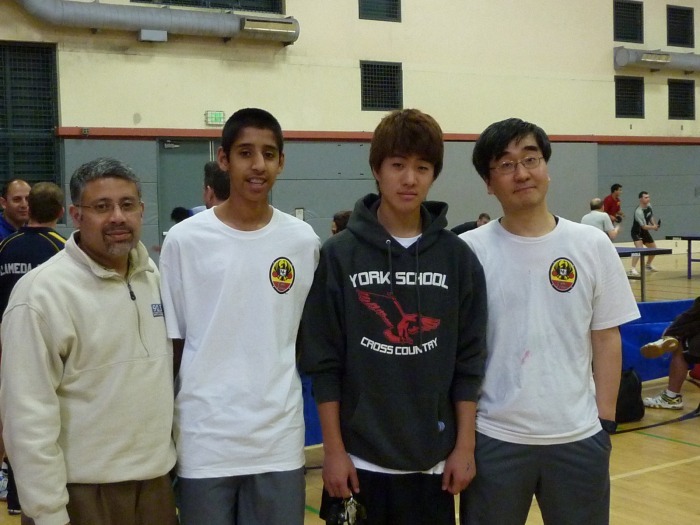 The Sacramento Winter Open was held at the Rosemont School (9594 Kiefer Blvd) on January 30, 2010. The entry must be RECEIVED by Friday January 22nd. The details and the entry from can be found here. - Bill participated and enjoyed himself. 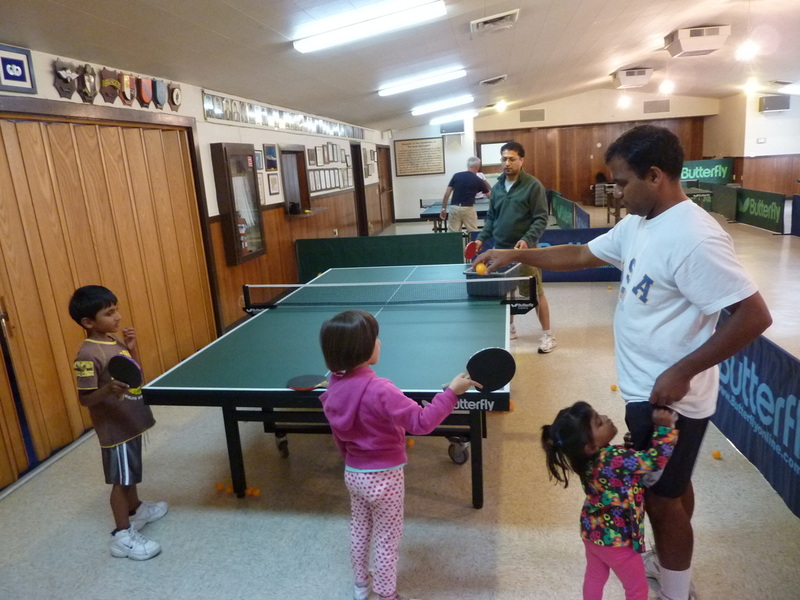 Free lessons to any children (or adults) who wish to learn table tennis. Families and friends enjoyed the great sport during the school break and holiday times. The clinic will return in 2010 summer, so stay tuned! - See below some clinic moments.